Among those 44 hotels there are only 5 star and 4 star hotels listed. I have been trying to build a hotel related websites for years, but never have been satisfied with results fully. Now I'm almost satisfied with results. So why 44? Not top 10, Top 20 or Top 100? Well, it's simple - according to Booking.com data there are 155 preferred hotels in Georgia , so I wanted to test how can I manipulate with new data I have, and idea for creating this post arrived, the question was just - how many hotels should I list here? So I asked to my better part of me to call me number between 1 and 155 (hoping she won't say less than 10 or more than 100) and number 44 come up. I like this number, total sum of it is 8. Which symbolizes infinity if rotated by 90 degrees. Infinity is the answer on question when my blog will be ready, it never will be, but it will improve brick by brick. 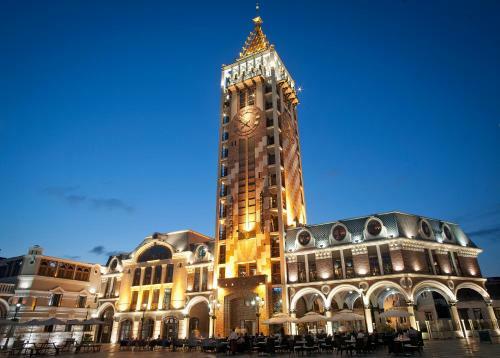 Now, back to the subject - 44 best Georgian hotels - most 5 star and 4 star hotels are located both in Tbilisi and Batumi, while there are high end hotels available in Kobuleti, Borjomi and Gudauri. Have a pleasant stay in Georgia! Located 350 metres from the Kura River, Rixos Borjomi features a spa and wellness centre with indoor pool, sauna, hammam, hot tub and medical treatments. Free WiFi and free private parking are available on site. 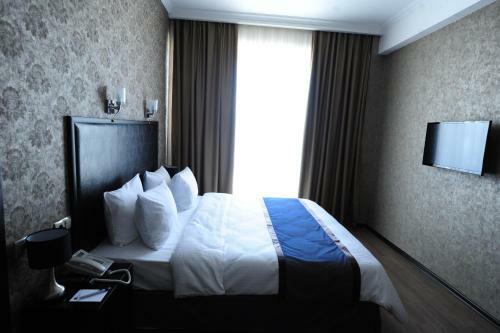 Hotels & Preference Hualing Tbilisi is located a 7-minute drive from Varketeli Metro Station in Tbilisi Sea District. Tbilisi Reservoir is only a 6-minute walk from the property. This magnificent 5-star hotel overlooks the main avenue in the centre of Tbilisi, 100 metres from the Kashveti Church. Tbilisi Marriott Hotel offers luxury interiors, a gym and sauna. 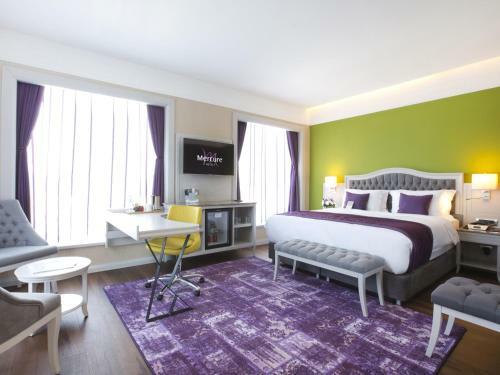 Contemporary-style rooms, free Wi-Fi and a restaurant serving European cuisine is offered at the Hotel Carpe Diem. It is situated in the heart of Gudauri, which is a popular ski resort. Located 800 metres from Varketili Metro Station in Tbilisi, Iveria Inn Hotel offers free WiFi and free private parking. All rooms are air conditioned and come with satellite TV and a minibar. Located in the centre of Gudauri Ski Resort, Good Aura hotel features a terrace, garden and BBQ. This property offers a free car park and free Wi-Fi. Hotel Good Aura provides free shuttle service to and from the cableway. This elegantly decorated, 7-storey boutique hotel is located on the slopes of Mtatsminda Mountain, offering beautiful views of Tbilisi. It features a sauna, gym and traditional Georgian and international cuisine. 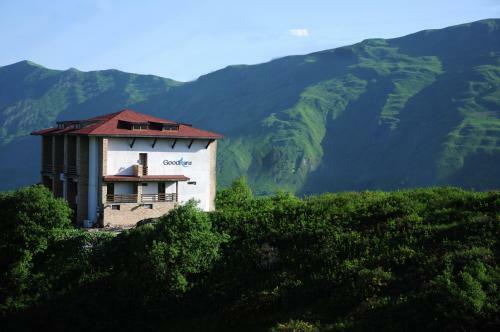 This hotel is located in the north of Tbilisi, 5 km from Tbilisi Reservoir. 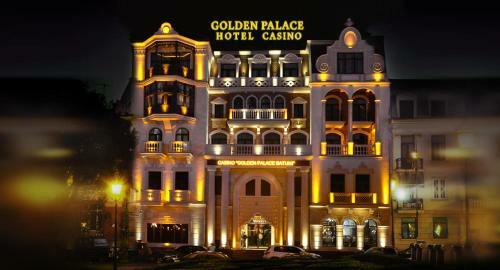 Billiards and free Wi-Fi are featured at Hotel Golden Palace. 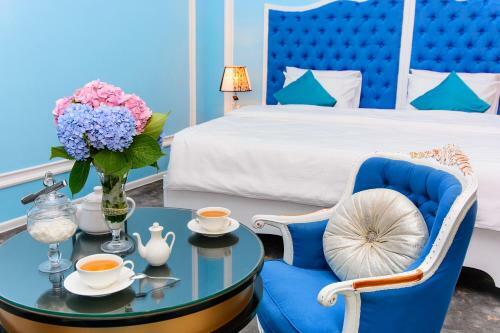 The bright, air-conditioned rooms offer warm-coloured interiors and modern décor. This hotel is located in the centre of Tbilisi, just a minute’s walk from the lively Rustaveli Avenue and Rustaveli Metro Station. Free Wi-Fi is provided at Rustaveli Palace. Located 600 metres from Rustaveli Metro Station in Tbilisi, Costé Hotel offers a terrace and lounge area. Free WiFi and free parking are available on site. The rooms feature air conditioning, a seating area and flat-screen TV with cable channels. 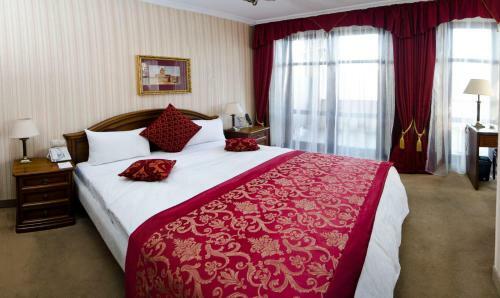 This hotel is located in the centre of Tbilisi, 100 metres away from Chavchavadze Avenue. Tbilisi State University is also 100 metres away, and Tbilisi Philharmonic Hall is 1km away. Free Wi-Fi is available throughout. Citrus Hotel is located next to the Parliament of Georgia in Tbilisi, within a 7-minute walk of Freedom Square. The Opera and Ballet Theatre is 700 metres away and Rustaveli Avenue is within a 3-minute walk. 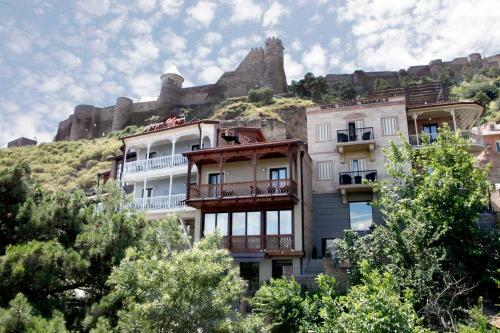 Featuring free Wi-Fi, this hotel in Tbilisi is just 5 minutes’ walk from the 7th-century Narikala Fortress. It offers air-conditioned rooms with a flat-screen TV. Featuring an elegant restaurant and rooftop terrace with panoramic city views, this 4-star hotel in central Tbilisi is 500 metres from Avlabari Metro Station. Its modern rooms have free Wi-Fi. 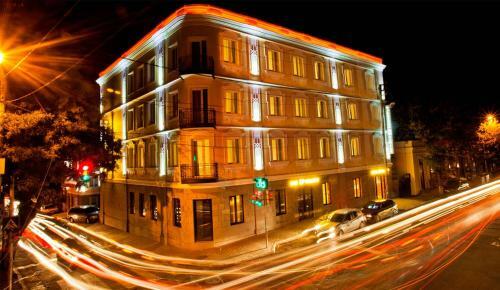 Featuring free WiFi and a terrace, Marionn Hotel offers accommodation in Tbilisi. Guests can enjoy the on-site restaurant. Free private parking is available on site. Certain units include a seating area for your convenience. 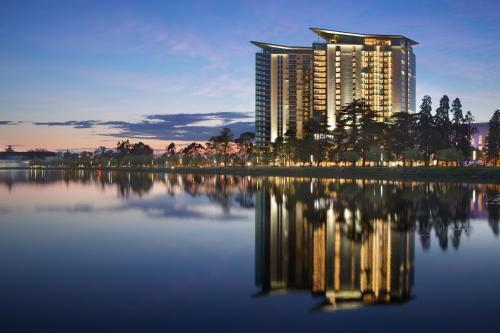 Free Wi-Fi, an indoor swimming pool and a fitness centre are features of this hotel. 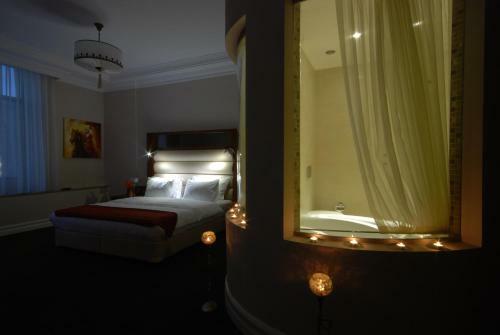 It is located in Tbilisi city centre, just a 10-minute walk from Rustaveli Underground Station. This 4-star hotel is located directly on the right bank of the River Mtkvari, in the historic centre of Tbilisi. The River Side offers free Wi-Fi and classic rooms with a balcony. 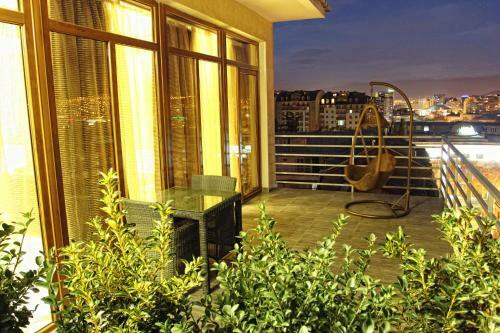 Located in the city centre, Astoria Tbilisi offers a terrace, 24-hour front desk, concierge service and tour desk. Free WiFi and free private parking are available on site. Located in Tbilisi, Vinotel Boutique Hotel features a wine cellar providing a rich wine selection. The professional sommelier offers wine tasting classes and guests can enjoy a variety of concoctions. 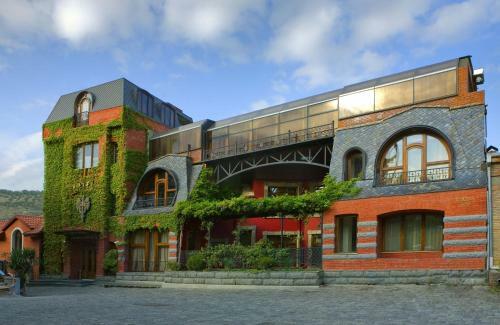 This grand hotel stands on the River Kura, in the historic centre of Tbilisi. It is a 5-minute walk from Rustaveli Avenue and the Tavisuplebis Moedani Metro Station. 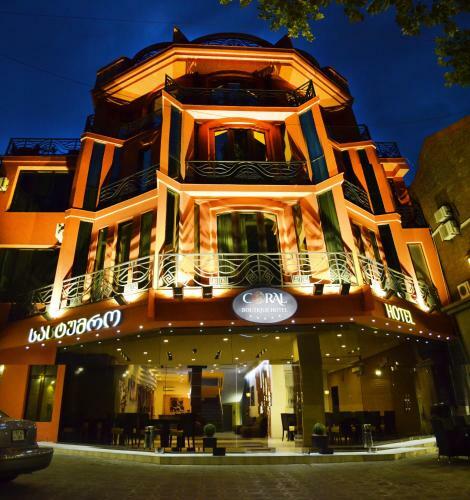 Featuring free WiFi, a fitness centre and a terrace, Coral Boutique Hotel offers accommodation in Tbilisi. Guests can enjoy the on-site bar. Free private parking is available on site. 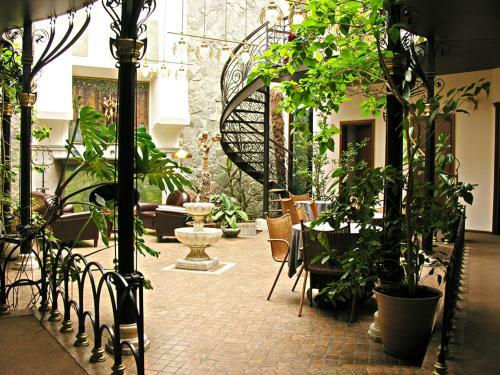 Tiflis Palace is located in the center of Old Tbilisi, a 5-minute walk from Metekhi Cathedral. Free WiFi is featured at Tiflis Palace. The bright, air-conditioned rooms offer light-coloured interiors and modern décor. 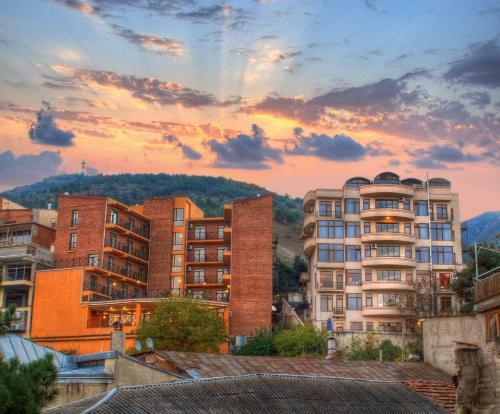 Located in the centre of Tbilisi, this 4-star hotel offers a restaurant serving Georgian and international cuisine, a spa area, and free WiFi access. Offering free WiFi and a terrace, Rooms Hotel Tbilisi is located a 5-minute walk from Rustaveli Metro Station. The rooms feature air conditioning, a minibar and a flat-screen TV. The bathrooms come with slippers and a hairdryer. Opposite the Sport Palace in Tbilisi, this hotel features an outdoor pool, large gym, and bar with mountain views. It has a private entrance to the Adjara Casino next door. Mercure Tbilisi Old Town is located in the centre of Tbilisi, a 5-minute walk from Metekhi Cathedral. It features a spa centre with spring water treatment and sulphuric baths. Free WiFi is provided. Located on Freedom Square in the heart of Tbilisi, this grand hotel features an indoor pool, fitness centre with sauna and an elegant restaurant. Tbilisi Old Town is within a 5-minute walk. Free private parking is provided. Featuring free WiFi, a restaurant and an outdoor pool, Pearl Of Sea offers accommodation in K'obulet'i. The hotel has a barbecue and views of the sea, and guests can enjoy a drink at the bar. Free private parking is available on site.